Since completing Death to the Daleks, Terry Nation had been developing new Dalek storyline ideas for inclusion in the 12th season of Doctor Who. The following months would see discussions with the outgoing producer and script editor, Barry Letts and Terrance Dicks. The initial ideas were deemed to have too many similar ideas to Nation’s previous Dalek tales and so Letts encouraged Nation to explore the Dalek’s origins which had never been covered in any great detail. This was amongst Letts last work on the show. Incoming script editor Robert Holmes disliked the Daleks but Letts persuaded him the idea could work and Holmes met Nation to develop the ideas of genetics and scientific morals. Nation produced a storyline entitled Daleks – Genesis of Terror and the scripts were commissioned on 1st April 1974. During the spring of 1974 Philip Hinchcliffe was appointed as the new producer of Doctor Who. Hinchcliffe was also disinterested in the Daleks but as the draft scripts came in decided he would make a story that would appeal to an older generation as well as children. He accepted the final scripts on 22nd July 1974. Now entitled Genesis of the Daleks, Nation had introduced the character of Davros as the creator of the Daleks. Nation had already written the beginnings of the Daleks twice before for comic strips but had never really covered it in his TV work previously. Nation was aware that the dialogue of the Daleks could be dull and predictable and so Davros would have a more ‘human’ speech pattern, thus introducing more opportunities for dramatic verbal sparring with the Doctor. David Maloney was appointed as the director of the serial, having last directed for Doctor Who on 1973’s Planet of the Daleks. Hinchcliffe felt Maloney’s previous work with the Daleks would bring out the best from what many would come to consider Terry Nation’s best work for the show. Maloney did make several changes to the script that took the story into slightly grittier territory and more in keeping with the vision that Hinchcliffe had for the show. Whilst working on Planet of the Daleks David Maloney had overseen the creation of seven new Dalek props, termed ‘Goons’ by the production team. Although he was never entirely happy with the quality of the workmanship on the props they did feature prominently throughout the serial. Due to the props’ extracurricular activities at public events and the like, they often were returned damaged. One of these recent activities had been the opening of the Blackpool Doctor Who exhibition on 10th April where Goon i was on hand to help wow the crowds. Elisabeth Sladen at Goodwood in 1974. Click for a larger view. Two of the props also starred in a mini ‘live’ story in May. 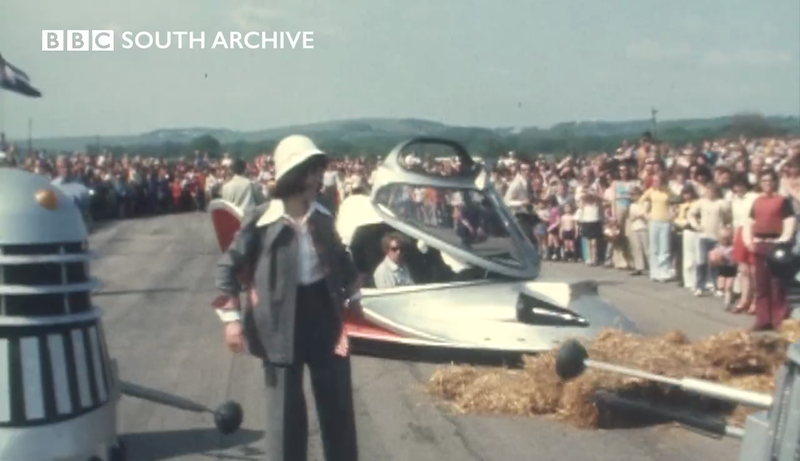 With Jon Pertwee having recently vacated the role of the Doctor, it was down to Elisabeth Sladen as Sarah Jane to repel four Daleks and Aggedor in the short play acted out at Goodwood Motor Racing Circuit in Sussex. 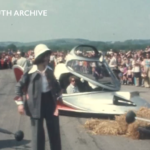 The special day was a ‘British Leyland Test Day’ organised by the Hares Motor Group and featured a number of other attractions. Jon Pertwee ‘appeared’ audibly in a section that he pre-recored. Dalek One-7 and Dalek Seven-2 appeared and had had their standard guns refitted. Two other fan built Daleks were also used and appeared to be based on the infamous inaccurate Radio Times ‘Build a Dalek’ plans from the 1973 special. They were painted to resemble the gold and black Supreme Dalek from Planet of the Daleks and ‘The Red Top’ that were owned by Terry Nation. A video of the event can be seen here. With two of the other Goon props, Goon iii and Goon vii, having been used as SFX props and destroyed during the making of Death to the Daleks they were therefore removed from the ranks. Maloney now found five Goon props remaining in storage at Pinewood along with the three Shawcraft props. 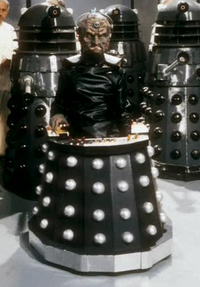 Terry Nation’s script concentrated on the new character of Davros and as such the Daleks feature relatively little until the final episode. The three Shawcraft props would be able to carry the work for the majority of the episodes with Maloney electing to use four of the five available Goon props as fillers for the final scenes which would require more Daleks. It might be expected that a story concerning the creation of the Daleks would mean that the props themselves would be refurbished to a style closely matching that of the original four Daleks, but as usual budgets at the time didn’t allow for major changes or new builds and so a small amount of work was carried out to the props to get them ready. Dalek Six-5 received the majority of the refurbishments carried out. Its dome, that it had first received in Planet of the Daleks, had had several small holes drilled around its circumference during refurbishments after being stolen from the BBC in 1973 – these were filled. The shoulders were showing quite considerable damage and so a new set of gunboxes were made and inserted. The boxes were slightly wider than the originals and due to the internal bracing required, four large bolts appeared around the oval between the boxes. Dalek Seven-2 and Dalek One-7 received very little refurbishment and all the wear and tear seen in recent Dalek serials – such as sagging collars and slats – was still apparent. However the necks were neatened and refitted slightly resulting in a slight lift from the shoulders. The four Goon props selected were Goon i, Goon ii, Goon iv and a hybrid of Goon v’s shoulders and Goon vi’s skirt, termed Goon v-vi. A heavy coat of gun metal grey paint was applied to all the props which was in keeping with the militaristic ideas of the story. Although its was one of the simpler paint schemes in the props’ history it also became one of the most popular. The refurbishments were carried over during August and September of 1974. 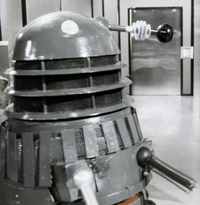 Having encountering problems with prop movements on location during his previous Dalek serial, Maloney decided to structure the episodes so that the props were only needed for studio taping which began at the end of January 1975. A great deal of thought was given to the look of the creator of the Daleks, Davros. Nation had envisioned a design that echoed that of the Daleks themselves – A single electronic eye in his forehead, a single outstretched arm resembled a Dalek arm, and he sat in a base very similar to a Dalek. Although the base resembled a Dalek skirt it was smaller and had fewer panels. The dashboard controls used various switches and flashing lights. Undoubtedly the most important design aspect had to be the mask. The design and creation of this was given over to John Friedlander whose experience making masks for the show previously was invaluable. Earlier work of his had included the very impressive Draconians for Frontier in Space in 1973. The ultimate ‘echo’ of the Daleks’ character in their creator came about with the casting of Michael Wisher as Davros himself. Wisher had provided voices for the Daleks in several recent stories. The ‘Mekon’ like mask was made for Wisher’s features, and the overall design of Davros became one of the most iconic in the show’s history. A couple of months before location filming began on Genesis of the Daleks in early January 1975, Dalek props of a different kind would make an of appearance in the press. On 7th November 1974, two of Terry Nation’s four film Daleks were used at a photocall for the upcoming stage play Seven Keys to Doomsday. The play, written by Terrance Dicks, was due to open on the 16th December and was originally to star Jon Pertwee. However as Pertwee had left the role and Tom Baker was busy making the new television episodes, actor Trevor Martin was cast to play an alternative fourth Doctor. The photocall outside the Adelphi Theatre featured the Planet of the Daleks Supreme Dalek, now looking a little battered and missing its sucker. The other of Nation’s props was even more unusual in its appearance, having suffered a number of clumsy and ugly modifications since its appearance on the big screen. 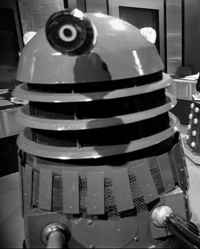 Neither of the props actually featured in the play as five specially-constructed Daleks were made which took design cues from the Supreme itself. They were therefore given the flat-edge neck rings, wide spaced rivets on the slats and film-like fender. he plot of Genesis of the Daleks was centered around the character of Davros and as consequently the Daleks feature relatively little until the final episode. 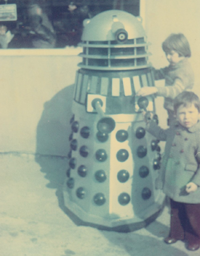 Episode one did see a supposedly ‘early’ prototype Dalek – but it was a normal prop without its sucker arm. 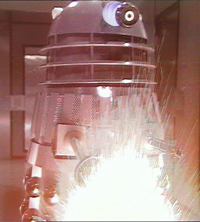 Episode two would see another prototype (played by Dalek One-7) fitted without its gun. A specially-created Dalek gun was then seen to be fitted into the prop. Episode six would see the first use of the four Goon props in this serial. As it had done in Death to the Daleks ,Goon i became a temporary FX prop in the scenes set outside the incubator room. Dalek Six-5 was used for the initial shots of the Dalek approaching the explosives, but is substituted with Goon i for the final shot. Stage-hands moved the goon prop forwards, to disguise the jump to the less-valued casing, and the pyrotechnics were set off directly in front of it. This was not the only time a goon was seen to move in Genesis. When the Daleks surround the scientists in the bunker, one is pushed into frame to show four props moving in a single shot for the first time since 1967. The final scenes in the bunker required all seven props, and the four goons were placed behind the the main Daleks to bulk up the numbers. Developments in SFX technology allowed for a visible ray effect to be used for the first time on the Daleks’ extermination effect. The ray was placed into the picture using the Colour Separation Overlay technique. The third studio session was planned for Monday 24th February but before work began, there was a public airing of the new-look TV props. Tom Baker took part in a photocall to promote Genesis of the Daleks outside Television Centre, with four Dalek props. The pictures which would be used for decades to come featured Dalek Six-5, Dalek Seven-2, Goon ii and Goon iv – all looking in fine condition having just received their refurbishments and new paintwork. With studio taping completed, Genesis of the Daleks went out between 8th March and 12th April 1975. It was very well received and would continued to be remembered very fondly whilst standing the test of time for many, many years. Crackerjack! was one of the BBCs longest running and most popular children’s shows. It was a mix of games quizzes, music and comedy and began life in 1955. The mid-70s period was one of the most fondly remembered and it came as no surprise that Doctor Who should feature, arguably also at the height of its popularity. 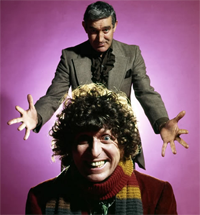 Resident comedians Peter Glaze and Don Maclean presented a weekly sketch and during the run of Genesis of the Daleks on TV they featured one based on the show. Called “Hello My Dalek”, Don Maclean featured as ‘Doctor Why’ with a suitably overlong scarf. Peter Glaze played the Brigadier. Much was made of the characters stepping on the Doctor’s scarf! 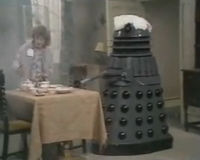 During the sketch, Dalek Six-5 made a short appearance. It appeared to not have been operated by one of the Dalek regulars as the eyestalk remained in a fixed upright position for the duration. Jim’ll Fix It created and presented by Jimmy Savile was proving very popular in its first season in 1975, and it was often shown prior to Doctor Who itself. On 12th July 1975 one episode saw the appearance of a Dalek. 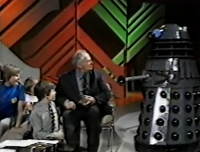 A prop had previously appeared on Savile’s Clunk-Click programme in 1973 and this time it was Dalek Six-5 that took questions from the children along side Patrick Moore who was also starring. Later that year, Blue Peter would again have to transmit an appeal for a stolen Dalek having done so before in 1973. But this time around it was a student-made Dalek that had been created for fund raising, not one of the genuine article. On 13th November the appeal for its return went out with Dalek Seven-2 was on hand in studio to remind people what a Dalek looked like, in case they had forgotten! The student’s Dalek was soon recovered and on 17th November Blue Peter announced that all was well. Q was a surreal comedy show written by and starring Spike Milligan. It began in 1969 and would run intermittently until 1982. 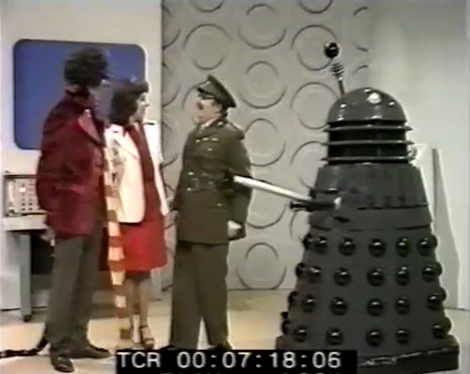 During 1975 Q was in its second series, confusingly called Q6, and the episode dated 11th December 1975 would see one of the most fondly remembered sketches from its run – and it just so happened to feature a Dalek. The skit in question involved a ‘Pakistani Dalek’ coming home drunk and generally causing havoc! Dalek Seven-2 fulfilled the role and was the last time the original Dalek Two’s skirt would be seen on television. Genesis of the Daleks was the fourth Dalek serial in as many years and despite the popularity with the public, the production team was not enamoured with them. It was therefore decided that a rest was needed so new enemies could be created, and it would be four years before the Daleks appeared again.